People sign in at Baltimore County Executive Johnny Olszewski's town hall at the Randallstown Community Center. 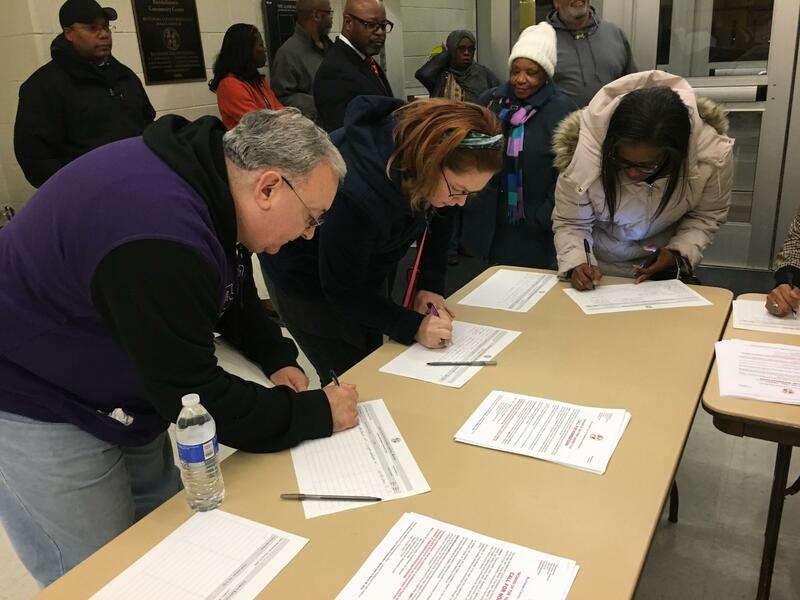 More than 200 people showed up and signed in for Olszewski’s town hall in Randallstown this week. And many of them lined up to tell the county executive they need a road repaved, or a traffic light at a busy intersection, or in Joseph Melton’s case, the brakes put on people speeding on Liberty Road, between Northern Parkway and Patterson Avenue. At another town hall in Towson earlier this month, Olszewski heard a lot about the need for parks and fixing overcrowded schools. Colleen Baldwin with the Pleasant Plains Elementary School PTA told Olszewski the school has nearly 200 more students than it should. “The level of overcrowding creates potential safety concerns during arrival and dismissal, in navigating the hallways and relocatables, and in providing adequate restroom and cafeteria capacity,” Baldwin said. There’s not much Olszewski can promise right now, as he grapples with how to fix the $81 million budget shortfall, which is projected to only worsen in coming years. He’s put in place the Baltimore County Commission on Fiscal Sustainability to study the county budget. Former County Executive Don Mohler, who chairs that commission, said Olszewski gave them clear marching orders. A sign of the times was on display earlier this week. Interim School Superintendent Verletta White presented to the school board a budget Tuesday that would increase spending next school year by less than one percent. This followed her first budget proposal, just two weeks before, that called for an increase of more than 11 percent. White was directed by the chair and the vice chair of the board to make the cuts. She also received a letter from the county executive, encouraging her to scale back her initial budget request. So the school board now has two proposed budgets from White, who at the board meeting made it clear which one she prefers. White cut her original request by nearly $86 million. Much of that comes from scrapping cost-of-living and step increases for teachers and a plan to extend the school day by 15 minutes. Education spending makes up nearly half of the county's operatiing budget. Olszewski said department heads are being told to watch every nickel. Olszewski is a Democrat. Republican County Councilman David Marks gives Olszewski a lot of credit for being open about the budget. “There's a refreshing outlook on things and I think having a level of engagement that the county executive has shown is very healthy for this county,” Marks said. Olszewski presents his budget to council in April. By then it will be clear how he plans to reign in spending, and if a tax increase, which would be the first in more than two decades, is part of the solution. Thursday, January 31 at Eastern Technical High School. Thursday, February 7 at McCormick Elementary School. Tuesday, February 12 at Catonsville High School. All the town halls begin at 6:30 p.m.